Paris (AFP) – French police fired tear gas to break up a picket line of striking prison guards at Europe’s biggest jail on Friday, as a fresh assault by inmates on staff at a facility in Corsica fuelled demands for better security. 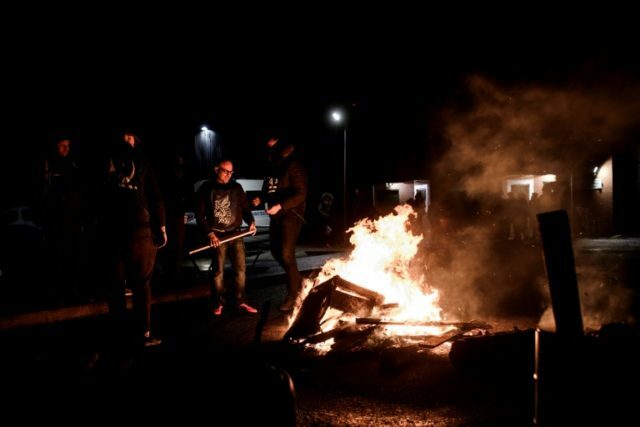 The scuffles at the huge Fleury-Merogis prison just south of Paris came as unions were pressing a fourth day of strikes across France sparked by a string of attacks on guards. The latest came in Borgo on the island of Corsica on Friday when three inmates, including one under surveillance for Islamic radicalisation, attacked two guards with a knife. One of the guards was seriously wounded in the throat but neither was in a life-threatening condition, said public prosecutor Caroline Tharot. A police operation was under way to apprehend the inmate suspected of wielding the weapon after he barricaded himself in a cell, according to a source close to the inquiry. The inmate was detained on charges unrelated to terrorism, but wiretaps had suggested he had been radicalised, the source said. It was the latest in a series of attacks on guards. Prison authorities said the strikes were affecting 80 of France’s 188 facilities. The Corsica attack led union officials to call off talks they had been holding with the justice ministry since Tuesday. But union officials and prison authorities have drawn up a draft agreement, including proposals to better protect guards and deal with radicalised inmates, which has been sent to the justice minister, a source within the prison service told AFP. Earlier Friday there were scuffles at Fleury-Merogis as guards protested the string of attacks that have focused a spotlight on security problems and radicalisation behind bars in France. Outside the entrance to the prison — Europe’s largest, with more than 4,300 inmates — around 150 striking guards had set up a barricade of burning tyres and wooden pallets to prevent their colleagues from getting to work, an AFP correspondent said. Riot police quickly broke through the picket line, firing tear gas to disperse the demonstrators and allow their colleagues to get inside. “The CRS (riot police) charged and fired tear gas at us but we tried to resist,” a 28-year-old guard, who gave his name only as Sacha, told AFP. On Thursday, security reinforcements had to be brought in to help after more than 100 prisoners refused to return to their cells following their midday walk in the yard, France’s prison administration service said. Other attacks in recent days included an assault by an inmate under surveillance for extremist views, who punched a female guard in the face at Tarascon prison near Marseille. On Monday, a convict considered at risk of “radicalisation” at the Mont-de-Marsan prison in southwest France attacked guards as he resisted a search. The prisons administration agency said nearly half of France’s 188 detention facilities had been affected by the strike action Thursday. On Friday, France faced calls by several member nations of the UN’s Human Rights Council to address the situation. “It’s true, much more remains to be done, prisons are suffering from persistent overcrowding,” the head of the French delegation said at a council working session.